Few mothers can imagine having strong enough ties with their family that they would choose to leave a daughter behind. This is that story. Eugenia Kim weaves this tale inspired by a true story with gentleness and respect. The Cho family decided to immigrate to America in 1948. Like most immigrants to American they wanted to take advantage of opportunities and find a better way of life. But they and their extended family in Korea never intended for the Cho family to stay. As part of that commitment the Cho family brings one of their daughters, Miran, to American with them but leaves the other daughter, Inja, with their extended family. The families separated by thousands of miles exchange packages and news and keep in touch as best they can. Then the unthinkable happens, what will become known as the Korean War breaks out, and their tenuous connection to each other is broken. While Calvin keeps up the chant of everything being alright and it will all work out, Najin, his wife struggles with a mother's guilt of leaving a child behind. She had already lost another child in a miscarriage while in the states. Now her other child's life is in danger. 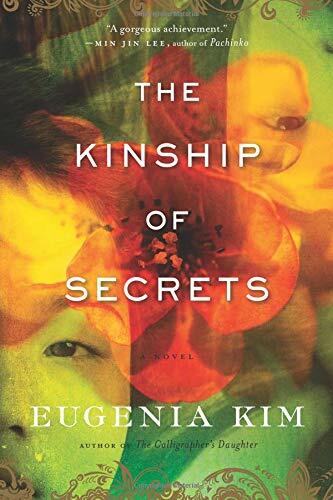 Eugenia Kim's tale artfully flows back and forth between the US and Korea, telling the tale from each family's point of view. She also includes the sisters in their own observations as children enduring their family drama and the complications of living in the Cold War era. The novel explores the culture, language, customs of Korea so the reader always understands why things are happening. Eugenia Kim uses the laconic and sparse language style of Korean short story writers. All the details are striking and clear, yet each character has their own voice. Years pass and the sisters are finally set to be reunited in the United States. Miran and Inja begin the journey of rediscovering their kinship and recognizing love. They work on understanding the reasons behind their mother's decision and ultimately the depth of her love. The sisters’ lives still weave in and out as they grow up in the United States during the turbulent 1960s. Miran realizes the impact of only looking Korean versus being Korean like Inja. Miran continues to struggle with her identity. Finally, Miran and Inja get their parents’ approval to travel back to Korea for a two-week visit. Miran and Inja's worlds continue to weave together as the entire family learns to strengthen and reimagine their ties to each other.